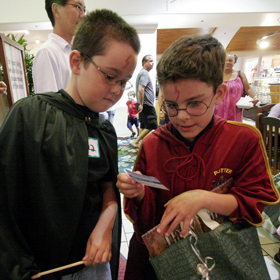 THE WAIT IS OVER » Jordan Long, 9, right, and Michael Deci, 9, looked over the prize that Long won for his Harry Potter costume yesterday at the Harry Potter costume contest at Kahala Mall. The last time a biter struck was 1958, and that victim did not live. Wolfhounds families continue Army tradition of hosting orphans from Japan. The Army has narrowed the field to Schofield Barracks, Fort Carson in Colorado and Fort Richardson in Alaska. Muggles embrace magic and swarm stores as "Harry Potter and the Deathly Hallows" is released. Recruiting and scheduling among topics Jones takes on. At 2.4 percent, Hawaii ties with Montana for lowest in the nation. The isle company's first-quarter earnings grew by 312.6 percent. Ground has been broken for construction of a courthouse for Family Court proceedings.